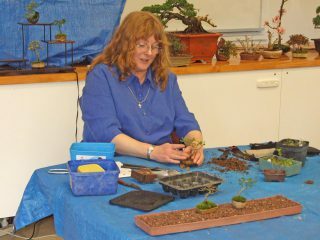 At that club meeting Sandra re-potted some small trees into a plastic crate to develop them as Mame Bonsai. 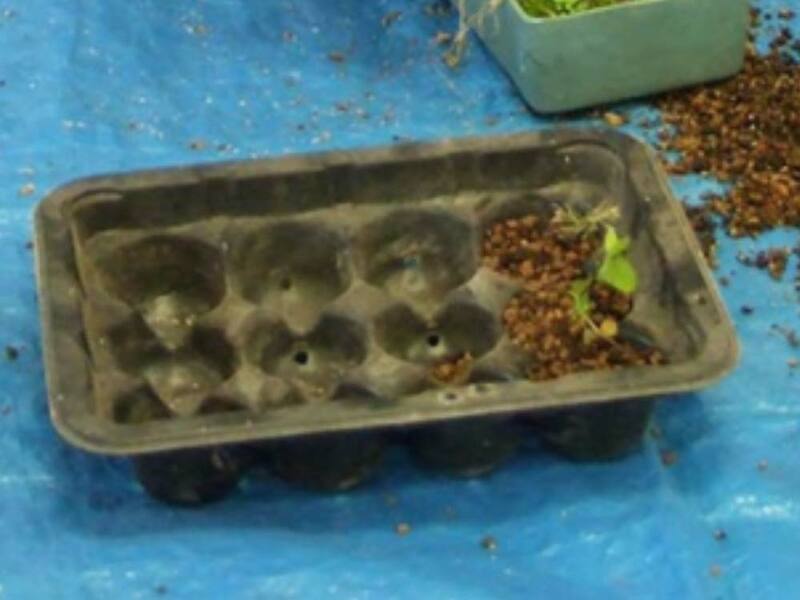 The beginning – planted up in a plastic crate. 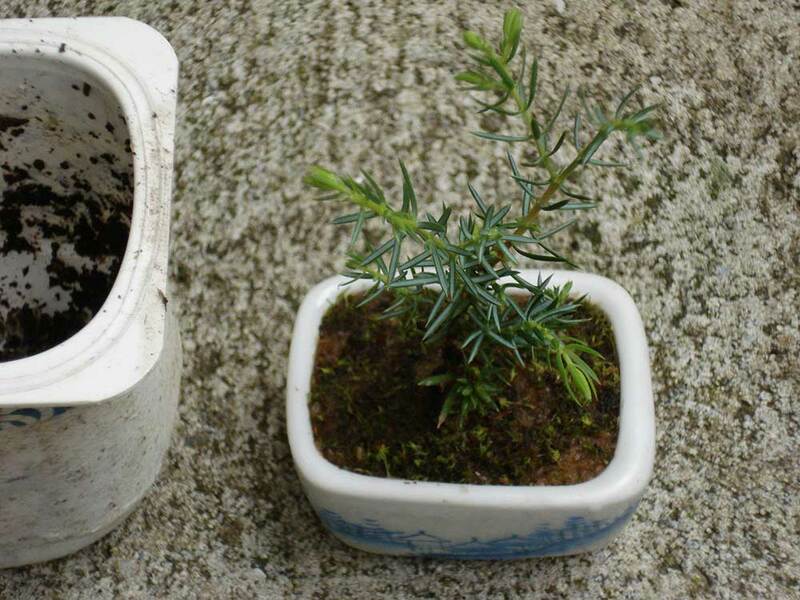 I re-potted the Juniper into a recycled margarine tub as it was suffering a bit in the small crate. I re-potted the Juniper into a Mame training pot. I re-potted the other thing (I think it is the common large leafed Cotoneaster) into a Mame training pot as well. 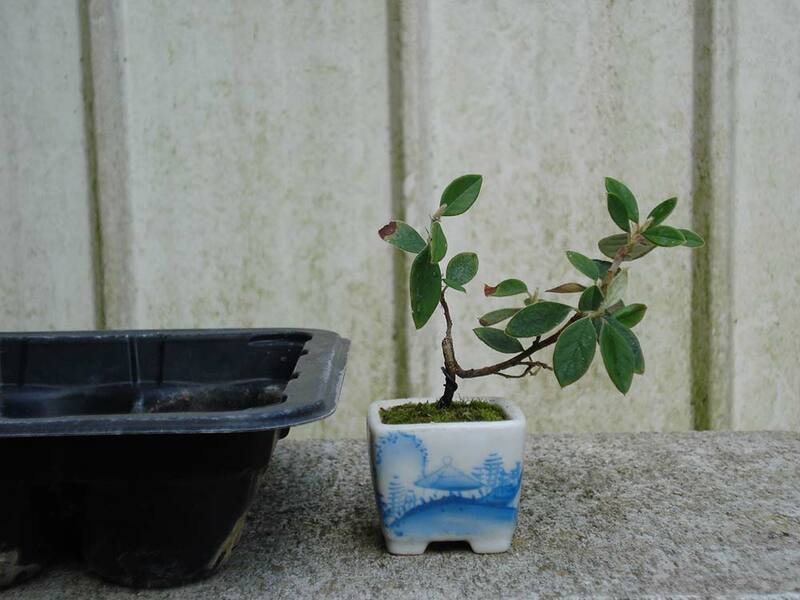 Size = 10cm tall including the pot. There is a smaller size called Shinto that is 7cm and a larger size Shohin that is 25cm from the rim of the pot. Spices = Spices that have small leaves, that tolerate root pruning well, and can tolerate getting too dry or too wet. 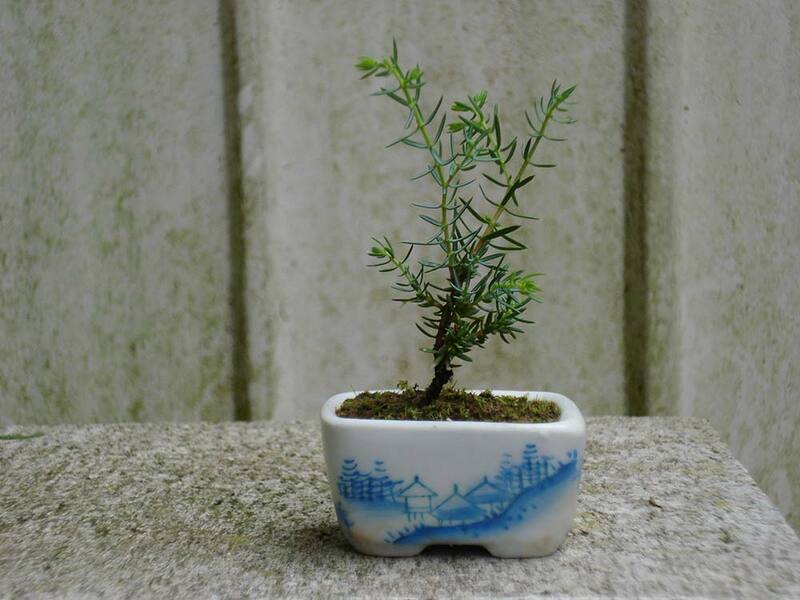 If it grows like a week it’s good for Mame sized Bonsai. Anything that grows as a weed. Keep them Outside in a spot that gets shade from midday, sitting on a tray filled with stone chip and water. Check every day that they have not tipped over or leaves etcetera have not fallen on them preventing water and light getting to them. Watered every day Spring, Summer, and Autumn and checked for water needs every day in Winter. Protect from birds, cats, dogs, and children. Feed = liquid feed (fertiliser mixed with water) every fortnight Spring, Summer and Autumn. Use the fertiliser full strength according to the instructions of whatever you use. 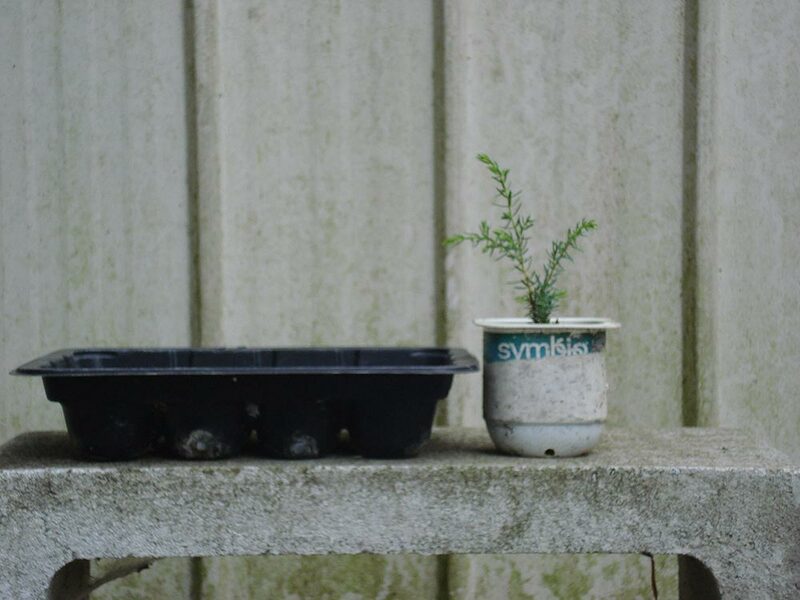 Potting mix – 3 parts Stone Chip or Pumas to 1 part Organic Compost + 1/8th of a part Chicken Manure. Prepare the pot with tie wires and mesh over the hole if needed. Mame need to be tied into the pot. 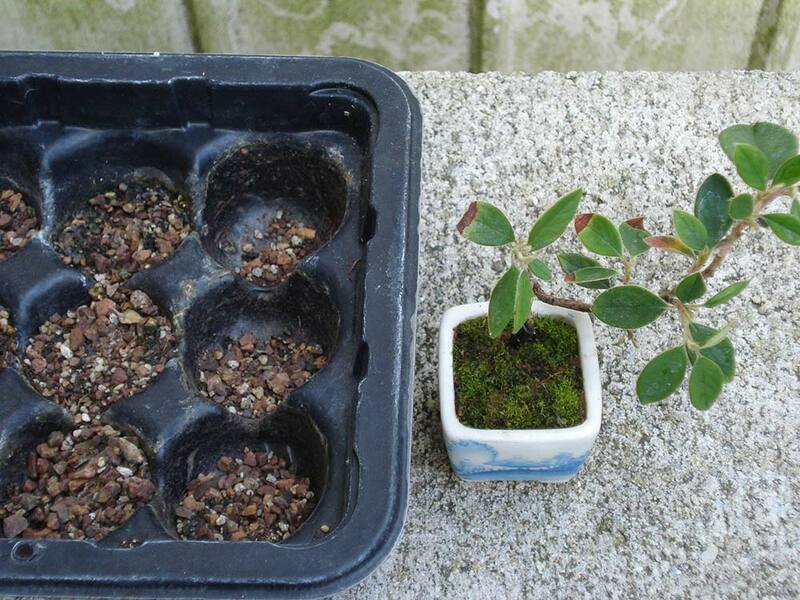 Take the Mame out of its pot and trim around the edges, bottom and top of the root ball only. Do not tease out or wash the roots. Put a small amount of mix in the pot place the Mame add more mix then tie the Mame in place. 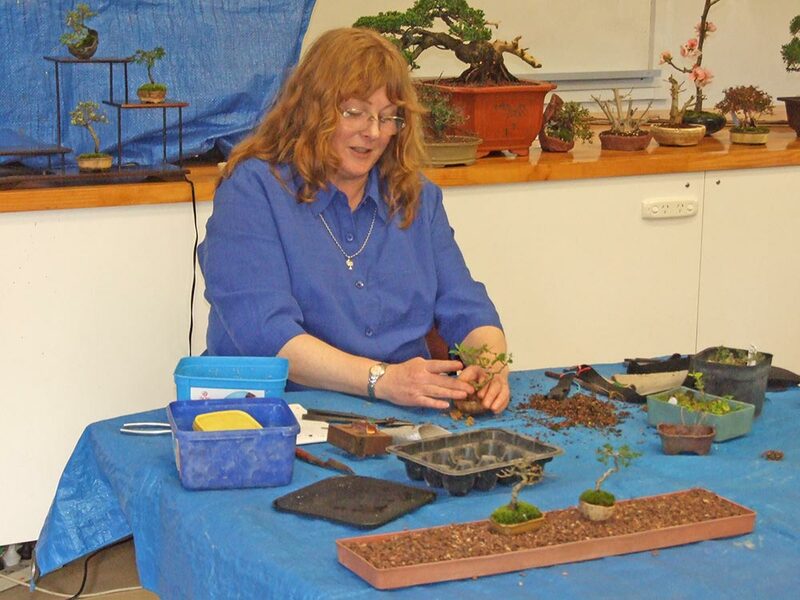 Gently water the Mame, then add very finely chopped sphagnum moss onto the surface of the pot. Place in a protected area away from strong winds birds, cats, dogs, and children. Do not water it again till it is dry, and do not feed it for 4 to 6 weeks.